There will be a historically short wait for the two Big 10 men’s volleyball schools to renew their annual rivalry next season. Penn State during the season’s opening week will travel to Ohio State for a non-conference match on Jan. 5 — the earliest meeting between the two teams in their 48-year series history. While the Nittany Lions lead the all-time series, the Buckeyes have won five of the last six meetings dating back to 2016. Ohio State won both matches in 2018, including rallying from a one-game road deficit to beat Penn State in five games. Ohio State as the two-time defending NCAA champions last season won its third consecutive MIVA championship and advanced to the NCAA Tournament semifinals. Among the starters returning for the Buckeyes includes Off the Block/Springbak, Inc. Freshman All-American opposite Jake Hanes. However, Ohio State will have to replace outside attacker Nicolas Szerszen who concluded his college career in 2018 as the conference’s only three-time recipient of the MIVA Player of the Year. 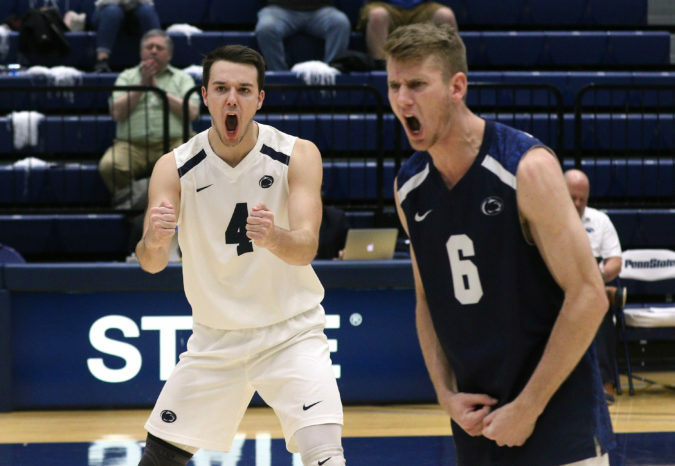 Penn State last season finished in second place in the EIVA — the first time during the rally scoring era that it did not win the EIVA regular season championship. It also was unranked to end the season for one of the first times in program history. Opposite Calvin Mende is one of two All-EIVA starters returning to the Nittany Lions in 2019. Despite missing part of the season because of an injury, Mende was in the conference’s top five with both a 3.33 kills per game average and a .314 attack percentage. The season opening weekend match will be the first of two meetings between Ohio State and Penn State next season. Penn State will play host to Ohio State to conclude the home-and-home series on March 20.